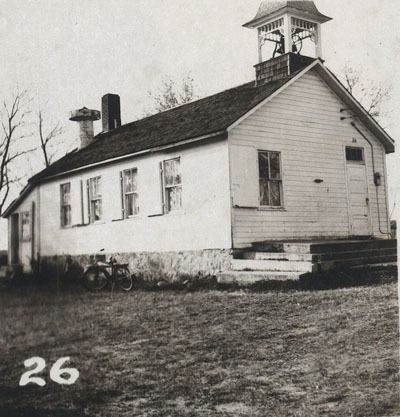 Fish Lake School in 1954. MODERN ADDRESS Located at 1800 St. John Drive in Woodbury. DISTRICT BOUNDARIES Western boundary was a couple miles east of the border of Ramsey County and the eastern border was near present-day Highway 95. Most of the poeple in this area were of German descent and there was a German school near this public school site. District consolidated with Stillwater and St. Paul Park schools in 1956. Other teachers: Mrs. Agnes Partridge, (the rest before 1898) Anton Rode, Emma Swanson, Lorenz Kruse, Sarah Noltimeier, Almo Strate Thomspon, Phoebe Hoenslin, Renata Franzman Thiel, Gertrude Augstin Bielenberg, Viola Picullel Nickelson, Mrs. Helen Schultz, Margery Knapp, Mrs. Lillian Bowell, Mary Skeffington Urtel.